Each of these life-changing books explores seven principles that can help you become a positive woman, mom, wife, and friend. Through biblical teaching, inspirational quotes, and true stories of women just like you, you will learn to incorporate these positive principles in your life as you have a powerful impact on those around you. Every woman--including you--has the potential to become a positive, powerful influence in her family, church, community, and world. - Publisher Friendship. It's one of the most powerful forces around. It adds peace to frazzled days, provides companionship for lonely tasks, and makes any joyous event twice as fun. Written by best-selling author Karol Ladd and her best friend, Terry Ann Kelly, this fourth book in the popular Power of a Positive series shares practical principles on how to be a friend and nurture friendships. Exploring topics such as "Building on Your Common Interests," "Attitudes and Actions That Divide Relationships," "Being Real with Your Friends," and "The Forgiveness Factor," this book will help you enrich current friendships and develop new and lasting ones. The easy-to-read format and you-can-do-it principles will change the way you view your friendships forever. Book jacket. About "The Power of a Positive Friend"
Friendship. It's one of the most powerful forces around. It adds peace to frazzled days, provides companionship for lonely tasks, and makes any joyous event twice as fun. Written by best-selling author Karol Ladd and her best friend, Terry Ann Kelly, this fourth book in the popular Power of a Positive series shares practical principles on how to be a friend and nurture friendships. Exploring topics such as "Building on Your Common Interests," "Attitudes and Actions That Divide Relationships," "Being Real with Your Friends," and "The Forgiveness Factor," this book will help you enrich current friendships and develop new and lasting ones. The easy-to-read format and you-can-do-it principles will change the way you view your friendships forever. Book jacket. 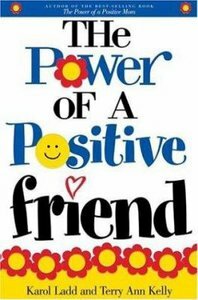 Customer Reviews For "The Power of a Positive Friend"
I found this practical book encouraging and helpful when I moved to a new town and set about the task of making new friends all over again. While a lot of the wisdom found within this book is not new, it is presented in a practical, thought-provoking manner. It also contains encouraging Bible passages and interesting stories from the authors' own experiences. I recommend it to any women seeking to make new friends and develop old ones.